Why has so little critical infrastructure protection passed congress? I mean, I understand why Congress is struggling on health care and tax reform. The reds and the blues have different opinions and different philosophies and apparently nobody wants to compromise. I get that. It’s the same on a lot of issues, and I understand the inability of Congress to make the sausage in terms of its lack of compromising and sharing. Watching the news out of DC, it seems like we are dealing with a bunch of adults behaving like kindergarteners. I can wrap my head around all of that. Here is what I don’t get: there is strong bipartisan agreement – and has been for decades – that critical infrastructure protection is needed. Yet, so little has been done. Don’t get me wrong – CIPA is awesome and a long time coming. But experts argue that it could be too little too late. The problem is that it will literally take years for CIPA to have a meaningful impact. It is a great start that will protect us years down the road (if the federal agencies and private sector entities do their jobs). But in the meantime, we are vulnerable. And, don’t expect everybody to trip over themselves over the next few years to protect the grid. What is “the grid”? The grid is over 3000 companies involved in generation, transmission and distribution of electrical power. “The grid” is not one thing. In fact, in the U.S., there are three “grids” which involve thousands of public and private sector utility companies. The federal government does not regulate “the grid” – it is self-regulated. Hmmm. Self-regulation worked out pretty well on Wall Street in 1929, 1987, 2000 and 2008. So, the federal government can’t tell “the grid” to harden itself. It can make suggestions. The Federal Energy Regulatory Commission (FERC) can make suggestions to the industry’s “lobbyist” The North American Electric Reliability Corporation (NERC). Remember, NERC’s constituents are companies that are either trying to make a profit (private sector utilities) or at least trying not to lose money (public sector utilities). Convincing NERC to adopt rules requiring its constituents to spend money hardening the grid is a tough sell. “The grid” does not want to be regulated. It enjoys the current slow and lumbering bureaucracy. I’m not saying that FERC is impotent or that NERC is evil (although I would not argue these points). What I am saying is that critical infrastructure protection is an immediate and exigent national security issue. Threats to the electric grid are existential threats to the United States. What we have needed from Congress for two decades are meaningful and immediate actions – actions that have had two decades of bipartisan support and two decades of failure to act. I have been researching these issues for years. 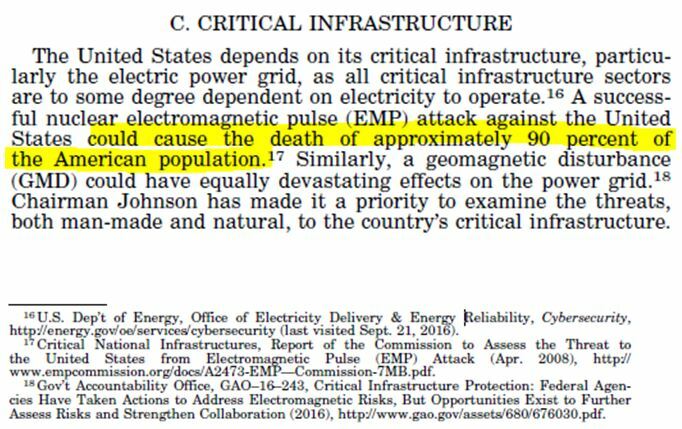 I have found that there are two decades of hearings, reports and failed legislation to protect the power grid from real and acknowledged threats. What are some of the threats? Even if you don’t believe that one or more on this list “could ever happen to us,” it is beyond debate that all have either happened or are possible. So we can all agree that there are threats to the power grid. So what if the worst happened? According to a March 2017 Senate report, up to 90% of the population of the United States could perish. How is this not a matter of exigent national security? How does this not constitute an existential threat the United States? Yet, Congress over the last two decades has failed to protect us. Instead, we are at the mercy of “the grid” which has larger concerns (money) than our meager lives and deaths. Enact immediate and meaningful critical infrastructure protection measures to harden the electrical grid and increase resiliency. 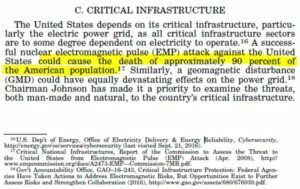 Immediately reestablish The Commission to Assess the Threat to the United States from Electromagnetic Pulse (EMP) Attack. Give FERC (or somebody) the authority to require “the grid” to take immediate measures to prevent a national catastrophe. Don’t wait. We have been waiting two decades. 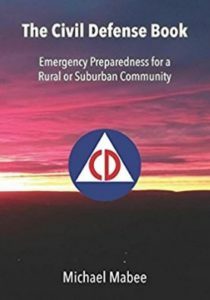 Take the cue from this failed house resolution and work with your community to make sure your community is prepared in the event of an emergency (any emergency). This is called civil defense. Make no mistake. Your family’s survival is at stake. We can no longer sit passively while Congress sits passively. We need action to protect our families and communities.